A transitional kindergarten student practices a number activity using colorful interlocking cubes at Allendale Elementary School's math festival Sept. 29, 2017. A dozen parents gathered around veteran math educator Leanna Baker, moments before students show up for what is billed as a math “festival” for students at Allendale Elementary School in Oakland. Interviews by EdSource with educators at several school districts suggests that a growing number of elementary schools are hosting events like these for students and families to convey the message that math is fun and can be practiced every day in simple ways in their own lives, not just in the classroom. The popularity of the events are a response, in part, to more rigorous Common Core math standards being implemented in schools across the state, along with attempts to help students —and their parents — overcome common math anxieties. The new math standards have been the most controversial, and challenging, aspect of the Common Core, with many parents saying they feel at a loss to help their students do homework aligned with the new standards. Mark Duncan, principal at Charnock Road Elementary School in Los Angeles, said his school has chosen to call math nights “Common Core Night for families,” with an eye to communicating with parents about the way math is taught using the new standards, and to prepare parents to help their children with homework. In Santa Ana Unified, math nights have expanded from a few schools, to a district-wide initiative to have every school host math events. Leanna Baker, veteran math educator and specialist with the California Math Council, asks a student to explain how he arrived at his answer, during a multiplication exercise at Allendale Elementary school’s math festival Sept. 29, 2017. At Allendale’s math event, activities set up at tables around the school auditorium where students, parents and teachers gathered were designed to help every child practice math. Activity sheets were labelled by level of difficulty, and students were encouraged to start with at levels they felt comfortable with, and work their way up. Teachers brought in small groups of students throughout the day to participate in the festival which ran from 11 a.m. until 3 p.m. when school got out. Some tables displayed story books about numbers for example, “Each Orange Had 8 Slices,” a counting book by Paul Giganti and Donald Crews. 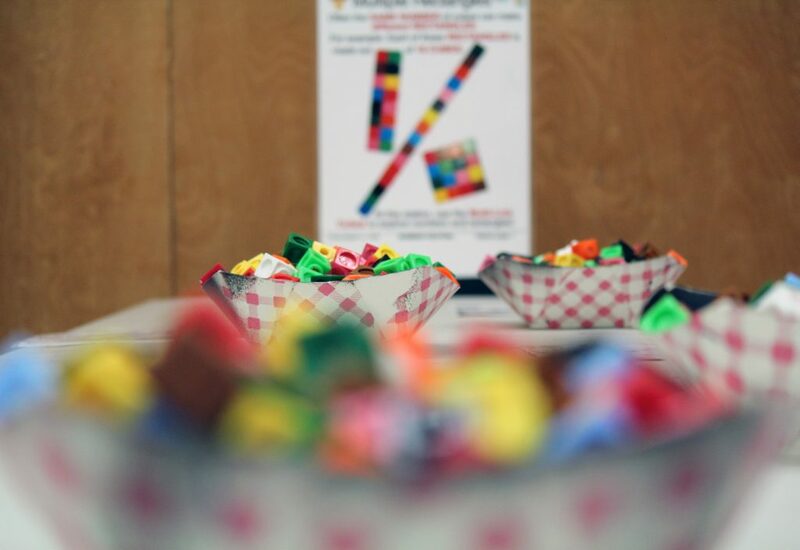 On others were colorful collections of plastic blocks, coins and squares that could be organized in multiple ways to help students better understand multiplication, addition and subtraction. At Patwin Elementary in Davis, math nights have been held twice a year for the past eight years. At its recent fall event, booths were set up around the school auditorium to encourage students to use mathematical reasoning with word problems. Math cards are numbered, 1 through 12 based on level of difficulty at Allendale Elementary school’s math festival. This table packed with colorful interlocking cubes is designed to help students use blocks to represent individual numbers in multiplication exercises. 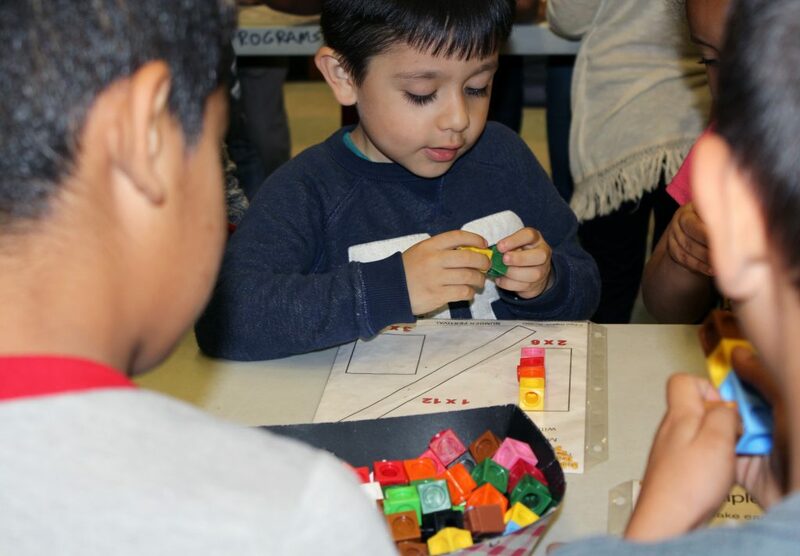 Diana Zaragoza, an early childhood education professor at Sacramento City College, began organizing math nights at Patwin Elementary when she was teaching there as a math specialist. It began with a math night at single school, which later expanded to eight elementary schools. Zaragoza said she started math nights because “families didn’t understand what (teachers) were doing and that was causing a disconnect” between schools and families when it came to math instruction. Building expertise in math, and enthusiasm for the discipline, requires effort at home, in elementary schools and in teacher preparation programs, Zaragoza said. 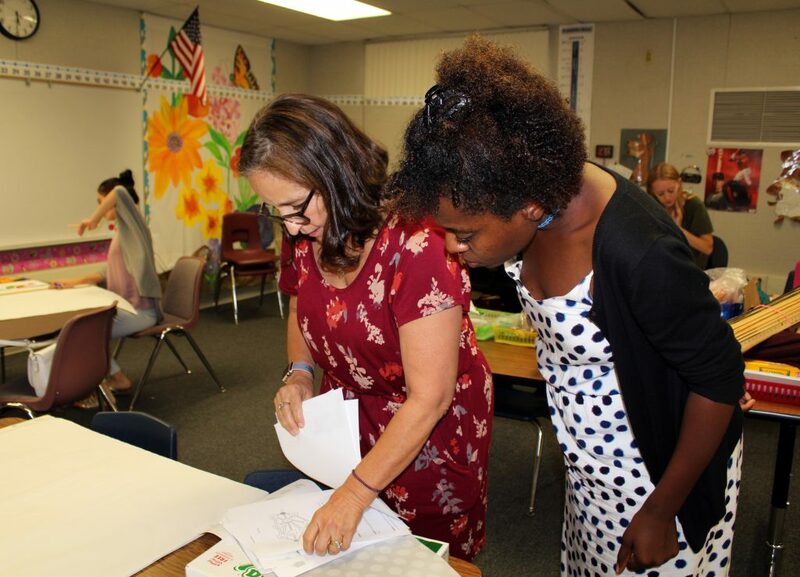 Sacramento City College Professor, Diana Zaragoza, reviews math activity sheets with student, Chelsea Richmond, 23, before hosting Patwin Elementary school’s math festival Oct. 17, 2017. Andrew Jenkins, now in his ninth year as principal at Coeur d’Alene Elementary in Los Angeles, said the school first began holding math nights in 2009. Jenkins said the events have been a great way to talk to parents about what their children are learning in math. Teachers provide parents with activity sheets and materials they can take home. What is crucial is to instill confidence in students from an early age. When children are still learning how to count in the early elementary grades, he said it’s important for parents and teachers to “think of students as capable” and not to convey “a ‘can’t do’ or an ‘it’s too-hard’” attitude, he said. 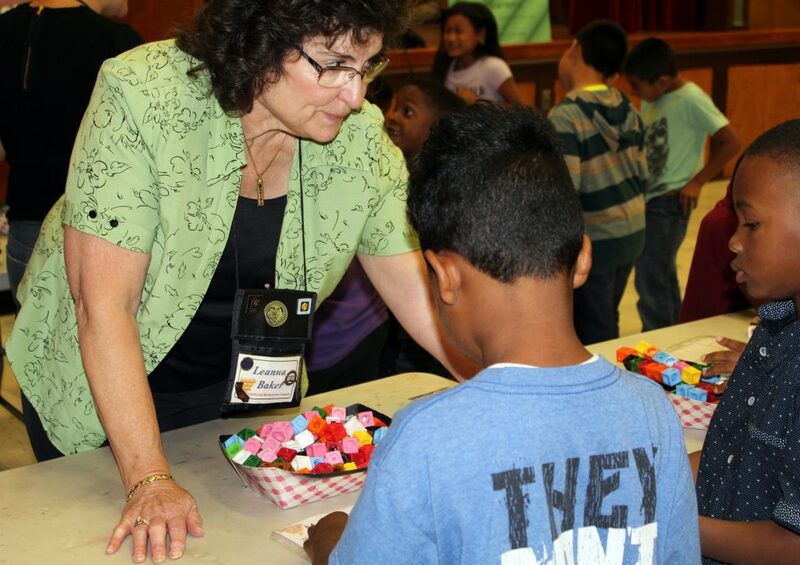 Carolyn Pfister, an education administrator for the State Board of Education, has helped to put together an online toolkit with resources and guidance for schools wishing to host their own math night or festival. 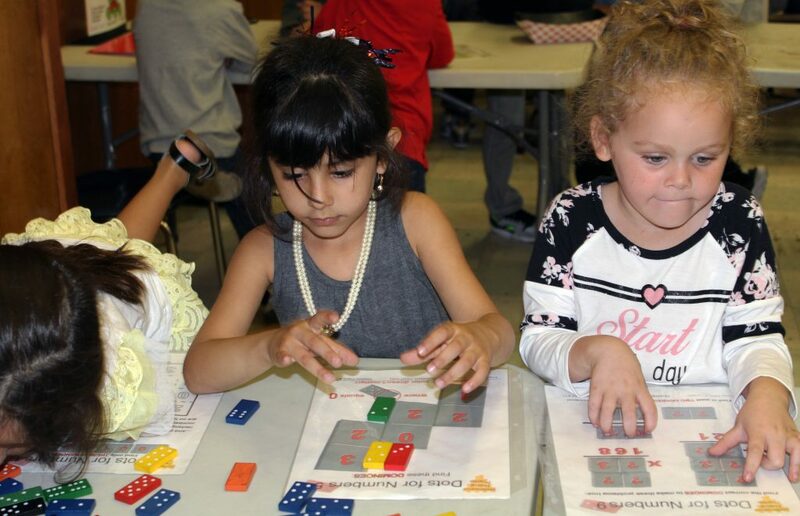 “One of the goals (of math nights) is to show early learning teachers and parents just how easy it is to provide really rich mathematical experiences,” she said. Students match dots on dominoes to numbers on cards in this mathematical exercise at Allendale Elementary school’s math festival Sept. 29, 2017. It’s all part of a crucial effort to get kids excited about math at an early age — and to sustain their interest over time. 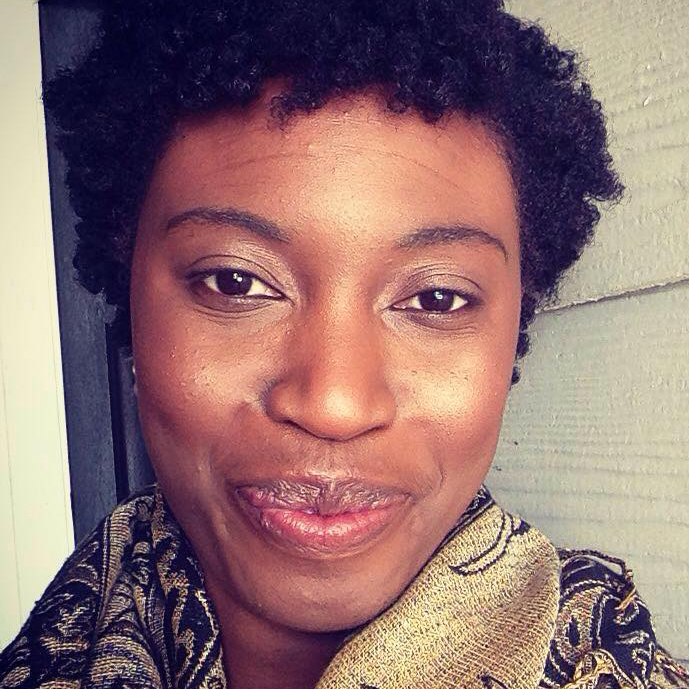 Sacramento City College’s Zaragoza wants to make sure kids don’t grow up “math phobic” as she did. “I just think that’s a horrible way for kids to feel,” she said. This article was very informative and helped me to better understand how giving the brain a break can actually help in learning more.